We’d love your help. Let us know what’s wrong with this preview of Here We Are & There We Go by Jill Dobbe. To ask other readers questions about Here We Are & There We Go, please sign up. Landing in a new country knowing not a single soul and having to recreate a social life can be daunting as can dealing with foreign illnesses and inadequate medical facilities. Simple tasks like shopping for a dinner party can become a major headache as you might have to travel to three or four different markets to get all the ingredients. There were a couple of problems I had with Jill’s book. One, before I even started reading it, I knew it would make my feet itch like crazy, making me long to set off back overseas for another adventure and I was right. Like the Dobbes, we have returned home to see our children through high school but at least once a week I find myself longing to pack my bags and head back off overseas. Expatriate life may have its trials and tribulations but it is seriously addictive. It is a bug one gets and never really recovers from. You may have a temporary reprieve and return ‘home’ for a season but I don’t think we ever stop longing for the adventure. The second ‘criticism’ I had about Jill’s book is I didn’t want it to stop. You know when you’re enjoying a book when you get to the end and almost swear at the author for stopping there. I wanted to hear more about their travels and their experiences in each new country. The book could have easily been double the size and still not long enough to cover everything they experienced. Then again, it is almost impossible to cram two decades of adventures overseas into 180 odd pages. The writing style is quite informal and chatty, which makes reading it very easy. I know I am borrowing this from others who have read the book but it did feel like we were sitting over a cuppa, having a chat about her experiences. I’m usually quite critical about writing style and flow of dialogue, and I’m not sure that Jill’s writing was technically brilliant, but I was enjoying the book so much I can honestly say I really didn’t notice. Was nice to see we had shared a couple of the same experiences, though have not actually lived in the same countries. In fact, while the Dobbes were dragging their toddlers all over Sydney I was living and working just around the corner from Sydney Harbour. We have also travelled to many of the same locations, which leads me to the one mistake I did pick up in the book. Jill, Pilanesberg National Park and Sun City in South Africa are northwest of Johannesburg not of Cape Town. Overall, a great book that will be enjoyed by others who have lived the expat life, those that are contemplating it or simply those that enjoy a good armchair travel book. This is a true to life story of a couple, both teachers, who raised their two children, Ian and Ali, while traveling around the world. Author Jill Dobbe and her husband Dan did not let their two young children stop them from traveling around the world. From their native Wisconsin their first stop was the island of Guam, in the picturesque village of Inarajan, where they endured not only the unruly behavior of their students but also the wrath of hurricane Yuri. This was just the start of a life of travels and adventures that will take them to more than thirty countries around the world. In the process they get to meet prominent personalities, learn languages and adapt to the most bizarre of customs and traditions. Going back to Wisconsin, they found out that home has a different meaning for them. How many of us have considered selling our homes, packing up our belongings, and traveling the world? For many people this is a dream. (At least it is for this girl!) The Dobbe family made it come true. This was a delightful book told in a conversational style. I felt as if I were sipping a cup of coffee with a friend while she told me about her shenanigans across the globe. And shenanigans there were! It was lovely to read about the people they met and the different schools they attended and worked at. Most gratifying was reading about how they dove into each culture with a desire to learn and enjoy themselves. After graduating college, I dreamed of where our world travels would take us. We made a list of all the countries we’d like to visit. We honeymooned in Cancun, Mexico and went to Spain during our first year of marriage. Spain was magical and wonderful but the end of my trek around the world. Sadly, my travel wish list is still unfulfilled. I use the excuse that it would be harder and more expensive to travel now as a family of 5. When Ms. Dobbe approached me to read her book, I wanted to see how After graduating college, I dreamed of where our world travels would take us. We made a list of all the countries we’d like to visit. We honeymooned in Cancun, Mexico and went to Spain during our first year of marriage. Spain was magical and wonderful but the end of my trek around the world. Sadly, my travel wish list is still unfulfilled. I use the excuse that it would be harder and more expensive to travel now as a family of 5. When Ms. Dobbe approached me to read her book, I wanted to see how she handled what I considered to be the impossible, traveling the world with little ones. It terrifies me the thought of get on an airplane with my sweet and adorable but crazy, fidgety and loud preschooler for a flight longer than two hours. I found her story remarkable and loved the way she described her kids and their ill-timed meltdowns. I was amazed at how they acclimated into these foreign cultures, often times not knowing a word of the native language (and I think it’s hard to understand a middle schooler)! I thoroughly enjoyed how Ms. Dobbe described the immense beauty of Guam, Singapore, Ghana, and Mexico, and gave a testimony to the hard realities they faced living in more primitive conditions. While here I am complaining when my internet is down, Ms. Dobbe lives for weeks without utilities when they move to a new location and have to hunt down a reliable person to help them. While here I think going on a weekend road trip can be cumbersome, Ms. Dobbe and her family hop in the car or plane to take advantage of every holiday to explore a new corner of the world. I really enjoyed Ms. Dobbe’s stories about how her children were impacted by their travels. How they met kids from all over the world and how with their blond hair and blue eyes, they were considered a minority and the natives would ogle and be curious about their appearance. How the kids acclimated easier in many ways to their new environments than the parents. And how the family got around and kept the kids entertained in the different countries….maybe the world isn’t so big after all, parents worldwide want to find ways to keep their kids happy and healthy. When my family went to India when I was a teenager, I remember the culture shock I encountered as we flew over the shacks and into Mumbai. The city was a dichotomy between the gorgeous hotels and magnificent buildings while the poor begged for change every time the car stopped. And it was not unusual to see a cow roaming the crowded streets along with throngs of people and honking cars. While my trip to India was only a couple weeks, the differences in our cultures surely made an unforgettable impact. Coming back to America after that experience, it was a reverse culture shock as Ms. Dobbe describes. After her family was away 10 years, the Dobbes came back to a very modernized, fast paced and materialistic society and quite a reverse culture shock indeed. I thoroughly enjoyed Ms. Dobbe’s conversational style and the lighthearted and sometimes life threatening experiences while learning about these different cultures. I’ve highlighted several excursions she described as places I’d like to learn more about and dare I say, visit one day. Overall, this was an easy and fast read as I just had to see where she and her family were going next and what they would encounter. What an incredible journey and an amazing childhood her kids had using the world as their classroom. I’m glad that Ms. Dobbe invited me to read along for the ride, she’s definitely inspired me to want to travel more! Jill and her husband were school teachers in Wisconsin USA when one day they moved half way around the world and their lives changed drastically. Like Jill’s children, I was born into the nomadic life of the serial expat. I lived in West Africa, Mexico, Asia, South America, and Europe, so I can identify with many of her experiences. I grew up speaking different languages, like her children did, and I continue to have the travel bug today. Like her children do. What truly amazed me about this book Jill and her husband were school teachers in Wisconsin USA when one day they moved half way around the world and their lives changed drastically. What truly amazed me about this book was that they just jumped headlong into it with no safety net and blinders off. They made the decision to move to Guam almost on a whim. They didn’t even know where Guam was. That was either very gutsy or completely crazy. And what was even more interesting was that they stuck it out, learned, and grew through it all. It didn’t sound like Guam was the dream South Pacific location we all imagined. It actually sounded pretty challenging. But they worked through it and learned a lot. That made their next posting to Singapore a bit easier. Of course Singapore was probably not a hardship posting. But they were still half way around the world from family and friends in a place with a different culture. They seemed to breeze through that one. By the time the got to Ghana they were seasoned travelers. Although, having lived in Nigeria myself, I know that Ghana was probably not paradise either. But as they came to understand, there are wonderful things all over the world. You just have to be open to them. Jill and her family discovered the joy, frustration, sorrow, and unending surprises one finds when traveling. I might be reading something into this but it seemed to me they decided to return to the USA for the sake of the children. Their children spent their high school years (or most of them) in the USA learning to be US citizens. This probably made it a much easier transition for them in the long run. It might have given them a clear identity at a young age. However, from my experience, it doesn’t work. My son returned to the USA when he was six and now that he is about to enter college all he dreams about is going overseas. And it seems their children were the same. They were happy to continue traveling. Returning to the USA was a difficult transition for all of them. Jill says she realized people were not interested in her stories and could not relate. I know exactly what she means. It is so far from what people know, it is difficult to imagine and therefore not interesting. Re-entry is a challenge for all expats but travelers know how to adjust and tweak and adapt. Jill and her family were no exception. They had a good few years back home with friends and family but the itch was still there. At the end of the book they leave the USA again for distant lands and new experiences. I think Jill has more to tell. Perhaps she will write part two some day! Check it out, it is worth the read!! Educator Jill Dobbe, along with her husband Dan, recount their journey to live and teach and visit all over the world. Thirty countries later, Jill shares this not-quite-over memoir of life abroad. Beginning in 1991 in Guam, Dobbe discusses the culture, tidbits tourists would miss about living among different cultures – for instance, although tourism is a major trade in Guam, the beaches are dangerous. The first ten years and four countries of working overseas, Jill taught elementary school and D Educator Jill Dobbe, along with her husband Dan, recount their journey to live and teach and visit all over the world. Thirty countries later, Jill shares this not-quite-over memoir of life abroad. Beginning in 1991 in Guam, Dobbe discusses the culture, tidbits tourists would miss about living among different cultures – for instance, although tourism is a major trade in Guam, the beaches are dangerous. The first ten years and four countries of working overseas, Jill taught elementary school and Dan high school science. It wasn’t easy adjusting, especially as different cultures treat education much differently. Discipline, language, lifestyle, and childcare were all issues the Dobbes had to deal with. Jill relates several lessons about traveling and working, such as most people wait months and months for household shipments to arrive and pass through customs; by which time the items arrive, they are nearly forgotten or the Dobbes had learned to do without. Some of the more quirky, frightening and poignant experiences of Guam, Singapore, Ghana, and Mexico include having to pinch pennies until the first payday and needing to sell off possessions and keeping or throwing out even teaching materials, a babysitter who wanted to take one child on a family visit in another country; living through natural disasters of earthquakes and hurricanes; two attempted adoptions; maps that mean nothing, uniforms in daycare, needing day and night guards, shopping, shopping, shopping, lizards, cockroaches, and touring all over the work during holidays and vacations. The Dobbes raised their children from one-year-old Ali and two-year-old Ian for ten years overseas. When the children were old enough to be in school, life got a little easier, and Jill wrote many times about how grateful she was to raise her kids globally. From 2001-2007 the Dobbes experienced a reverse culture shock in the craziest of all lifestyles—American—while they lived and worked in Wisconsin until Ian graduated from high school. After that, they returned to work overseas in Egypt and India. While Here We Are and There We Go is primarily a memoir, I enjoyed the universal appeal of Dobbe’s story. Wisconsinites do tend to feel as though we need nothing else to complete us, and I well understood her complaints of enduring the usual Wisconsin questions, why would you want to go there, why are you doing that, how can you take you kids so far away? We don’t deal with things like cat scratch fever and mango fly infestations too commonly in the States. Readers who love to experience different lifestyles, even from an armchair, will find much to treasure in Here We Are and There We Go. This is an unusual read for me. But it appealled to me because I have two children, I travel with them in developing countries every year (usually for about 4 weeks) and I am also a teacher. I've often thought about living and working overseas. I thought I would find it interesting, and I certainly did. Jill Dobbe's memoir is well written and engaging. It is divided into rather long chapters, each dealing with one of the locations they lived in. The first four chapters relate to a decade spent ov This is an unusual read for me. But it appealled to me because I have two children, I travel with them in developing countries every year (usually for about 4 weeks) and I am also a teacher. I've often thought about living and working overseas. I thought I would find it interesting, and I certainly did. Jill Dobbe's memoir is well written and engaging. It is divided into rather long chapters, each dealing with one of the locations they lived in. The first four chapters relate to a decade spent overseas when they were relatively young adults, new to teaching and with very small children (to begin with). The countries were Guam, then Singapore, Ghana and Mexico. The early chapters (Guam and Singapore) are dominated by the obvious difficulties of travelling and working overseas with pre-school children. Finding suitable childcare (so they could go to work) and accommodation. Toileting issues. As one who has travelled overseas with kids still in nappies, dealing with kids and their annoying bodily functions is a huge, huge issue that dominates parents' day-to-day lives. As it does when we live in our regular homes (to be honest) - it's just that it's so ordinary, few would stick it in a book. But I remember myself, changing nappies in crowded airplane bathrooms, by the side of the road, down alleyways, having to explain messes on sheets to hotel staff, poo in the pool - not fun, but part of real life with small kids when you are not safe at home. I read one review criticising this aspect of the book. To me it was honest and down-to-Earth and shed some light on one of the reasons lots of parents stay home while their kids are small! The first two chapters, for me, were less interesting than those that followed, however. As the kids grew, so did Jill and her husband. The discussion of their five years in Ghana was wonderful and vivid and it made me want to go there. After Ghana, Jill's family spent some time in Mexico, before heading home to the US so her kids could do their secondary education there. The culture shock chapter (describing what returning to the states and living there for seven years), was, for me, the best in the book. I found it fascinating and extremely thoughtful. The Jill and Dan I met a few chapters earlier seemed so young and innocent (almost a bit naive) compared to the worldly Jill who reflects of consumerism, the environment, and her own personal journey at the end of the book. 'Here We Are' is an honest, humble and human account of the experiences of ordinary people who chose to make experiencing different parts of the world a way of life for a lifetime. People migrate, they go on holidays - but they rarely spend their lives moving about the globe, seeking to immerse themsleves in new culture after new culture, experiencing not just its highlights, but the day-to-day. Have you ever wanted to chuck it all and just travel the world? That’s what Jill Dobbe and her husband Dan did, going from country to country, teaching in schools. From their first stop in Guam to the last stop in Mexico, Here We Are and There We Go chronicles the adventures of a globe-trotting family. The book reads as if the author is sitting at a friend’s kitchen table, telling about the amazing vacation she took. It has a folksy charm about it. Their initial stint as teachers in Guam was peppe Have you ever wanted to chuck it all and just travel the world? That’s what Jill Dobbe and her husband Dan did, going from country to country, teaching in schools. Their initial stint as teachers in Guam was peppered with fears of robbery. They worried that taking a walk in the middle of the night was not as safe as it had been stateside. What follows in this book is ten years of interesting anecdotes in different countries. Japan is a whirlwind of American food and Tokyo Disneyland. In Singapore, they throw a Christmas party for their friends, only to have the party crashed by Christian missionaries intent on converting someone. Also in Singapore, they live the heartbreaking story of adopting a child, only to have her die three weeks later. Key details are occasionally left out. This doesn’t so much hamper the reader’s understanding of the book, but it does make one wonder why the author omitted them. For example, when Dobbe tells of learning about Shoichi Yakoi, the Japanese soldier found living in the jungles of Guam in 1972, there is no mention of why he was there or why he had evaded capture for so long: twenty-eight years later, he thought World War II was still going on. The inclusion of this detail would have made the story so much more interesting. When I first encountered this book, I thought it would be much like “Learning to Bow” by Bruce Feiler – a recounting of his experiences during a teaching stint in Japan. Dobbe’s book contains many more anecdotes, more descriptions of her family’s attempts to adapt, and fewer introspective passages. That style seems to fit the subject matter, and the long span of time covered, well. There are some choice moments in the book. Her children grow up to be multi-lingual travelers themselves. And then there is this gem: ““I have become much more empathetic and appreciative of other cultures that exist in the world. Through my many travels and experiences I have come to understand that America is not the “best” country on the globe as I was always raised to believe.” It would be nice if more people in the world came to this kind of understanding. If you're considering traveling the world, or have simply always dreamed of it, then Here We Are & There We Go is the book for you. Jill Dobbe took the time to tell some of the many stories that, too often, forever go untold by countless numbers of people who live and serve abroad. Her book is filled with unique experiences she and her family have lived during their numerous years of travel. Whether you are reading about her husband, Dan, asking her to please stop shopping, Jill, we don't ha If you're considering traveling the world, or have simply always dreamed of it, then Here We Are & There We Go is the book for you. Jill Dobbe took the time to tell some of the many stories that, too often, forever go untold by countless numbers of people who live and serve abroad. Her book is filled with unique experiences she and her family have lived during their numerous years of travel. Whether you are reading about her husband, Dan, asking her to please stop shopping, Jill, we don't have enough room in our suitcases, or about their heartbreaking loss of an adopted child, Jill’s book illustrates their almost unbelievable, yet real-life experiences. This book feels authentic. The author wisely does not exaggerate, does not unleash criticism, and does not preach. The tales of the family's travels are lovingly recounted in a very real way, neither too brief nor too detailed. In short, this book is just right for the casual observer: one who has not been to these countries, is not an international teacher, or has the travel bug. I confess I have been to a few of the countries, especially Singapore where they did stay to teach. Their recollectio This book feels authentic. The author wisely does not exaggerate, does not unleash criticism, and does not preach. The tales of the family's travels are lovingly recounted in a very real way, neither too brief nor too detailed. In short, this book is just right for the casual observer: one who has not been to these countries, is not an international teacher, or has the travel bug. I confess I have been to a few of the countries, especially Singapore where they did stay to teach. Their recollection of Ghana, Africa, is probably the best in the book, perhaps because they stayed the longest there and there was so much contrast with the family's home country, the United States. Nor does this book accentuate the positive too much. The shortcomings of each destination are explained, but in a very professional way. As I stated earlier, the balancing of the tales told is very well done. These are not your typical boring travel tales of your uncle and aunt as recounted by them to you in their home with over 1,000 photos over several photo albums or a badly shot two-hour projector video. This book is very entertaining, and you even take away valuable lessons about how people live in other countries. I would definitely give this book five stars had it continued to tell the tales, in detail, after the family's return to their home state of Wisconsin. For some reason, although the parents went back (with an older daughter in tow for another year) to teaching overseas, after six years back in their home state, this part of the book, at the end, is much more abbreviated. Perhaps the author was wondering if her readers would tire of the overseas stories near the end of the book. Not so! I look forward, if possible, to more detail of their post-reverse cultural shock in teaching again overseas! It's very hard to make travel memoirs very interesting to the bystander (unless you're a celebrity, and then it would be about the celebrity, not the travels!). But this author pulled it off. Bravo! This book will appeal to both travellers and non-travellers alike. Those who have experienced this lifestyle will recognise the humour and the sheer unexpectedness of life in another country. As an expat myself, the stories resonate with me and I couldn't help but chuckle along - with empathy of course. For those who haven't travelled yet, then this may come as a stark warning, potentially putting some people off. However, for those people who have the same wanderlust, then this book will both a This book will appeal to both travellers and non-travellers alike. Those who have experienced this lifestyle will recognise the humour and the sheer unexpectedness of life in another country. As an expat myself, the stories resonate with me and I couldn't help but chuckle along - with empathy of course. For those who haven't travelled yet, then this may come as a stark warning, potentially putting some people off. However, for those people who have the same wanderlust, then this book will both amuse and enlighten them. At times the events seem a little repetitive, as if only the location changes. There is a tendency to keep reminding the reader of what a great experience it is to live abroad. This is reiterated ad nauseum to the extent that I had a recurring sense of déjà vu. The tales are very random and do not always flow easily, frequently going off-track just to squeeze in another story. As someone who has uprooted my immediate family and deserted friends and family to scratch the itch of “doing something different” on more than one occasion, I couldnt wait to read this story of someone who was as mad (and some would say as irresponsible) as me! I was not disappointed. From Guam to Ghana and Singapore to Cairo the book takes the reader along for the ride and I felt I was constantly watching in the background as Jill and her very young family uprooted from the safety of Wisconsin As someone who has uprooted my immediate family and deserted friends and family to scratch the itch of “doing something different” on more than one occasion, I couldn´t wait to read this story of someone who was as mad (and some would say as irresponsible) as me! I was not disappointed. From Guam to Ghana and Singapore to Cairo the book takes the reader along for the ride and I felt I was constantly watching in the background as Jill and her very young family uprooted from the safety of Wisconsin and headed off across the world in search of adventure and a fuller life for their children. The book, like their life, hurtles along like a runaway train and you just want to hang on for the ride and see what is round the next bend. The story is interesting and well written and a must read for those who would love to “be brave” and have the courage to do what Jill and Dan did. And for those who would rather stay at home and dream, this is your chance to live the life at secondhand! As a world traveler and writer I often find myself struggling to accurately describe my experiences and adventures overseas. It is so hard to convey the wonderful craziness that is travel and yet Jill has managed to do it in a way that transports the reader into her experiences with her family teaching in Guam, Africa, and Mexico and then perfectly describes the tough transition back to "normal" life. Her honest personal antidotes and revelations of her less than perfect parenting moments made m As a world traveler and writer I often find myself struggling to accurately describe my experiences and adventures overseas. It is so hard to convey the wonderful craziness that is travel and yet Jill has managed to do it in a way that transports the reader into her experiences with her family teaching in Guam, Africa, and Mexico and then perfectly describes the tough transition back to "normal" life. Her honest personal antidotes and revelations of her less than perfect parenting moments made me identify with her on a personal level as well as laugh out loud at times. An easy and enjoyable read that will give you another perspective on travel and living life outside the box. Great book for parents considering living abroad with children and want to get an idea of what it might be like. This family had some fun, wild, and scary adventures as their children grew up in countries around the world. ‘Here We Are & There We Go’ is a personal account of the author’s experiences whilst, together with her husband and children, on teaching assignments in a variety of countries. During the reading of this tale you may well agree with some of their relatives, who thought them crazy to undertake such a lifestyle with their two young children; one and two years old at the start. As a mom/educator who's also from the Midwest and has traveled to more than 20 countries with her kids and husband, I am reassured that many of The Memories We have from our family aren't completely bad or a way to scar our children for their whole lives. I am grateful for how she sums up the relationship that the parents and kids have today as adult, and the kids are adults and are making their lives in the worldwide job place. what a wonderful story and life they've lived. This autobiographical travel book is a great read on many levels. Nicely illustrated, it tells how Jill, her husband Dan with two children in tow, traveled the globe as educators. Jill is an accomplished storyteller and paints realistic and enjoyable character descriptions. Hers is a very honest picture of planet Earth from beach paradise, majestic mountains, historic buildings and ethnic hospitality to urine smells, nasty parasites, throwing up, poverty and death. Jill describes the whole spect This autobiographical travel book is a great read on many levels. 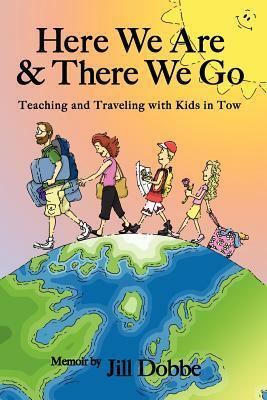 Nicely illustrated, it tells how Jill, her husband Dan with two children in tow, traveled the globe as educators. Jill is an accomplished storyteller and paints realistic and enjoyable character descriptions. Hers is a very honest picture of planet Earth from beach paradise, majestic mountains, historic buildings and ethnic hospitality to urine smells, nasty parasites, throwing up, poverty and death. Jill describes the whole spectrum of what this Wisconsin family experience, without judgement or any sense of superiority. When my kids were young we lived in Upstate New York for six months (travelling from the UK) and I can totally relate to the painful descriptions of trying to make toddlers keep still and quiet on a long flight. I dare not begin to imagine the perils of taking young children to live in Ghana! This family are not the type of Americans who flee from the plane to the nearest Holiday Inn. They gladly embrace global culture and happily accept whatever local accommodation is provided. There are also moments when I found myself laughing out loud, not necessarily because Jill had carefully crafted a joke but because her descriptions of what they experienced deliberately draw out the humor of each situation. Dan and Jill are clearly very fine people who set out not only to see the world but also to spread a little light wherever they go. They eagerly befriend, support and adopt local people, participate in other faith and cultural events whenever the opportunity arises and single-handedly (Jill) boost the local economy by buying up every craft item from fabrics, blankets, pottery to larger items of furniture. Witness the family finally driving home to Wisconsin from Mexico in a crowded Jeep that contains a large Labrador, a family of four with their luggage and a lavish selection of craft items from across the globe. I really loved this book. It gives a unique insight into some diverse cultures. Please don’t be put off by Guam and the diapers on the beach, bad plumbing, snakes or the Mexican cockroaches. This book is a mammoth journey of discovery. Jill is a woman with a vision to teach her way across the globe and, even better she and Dan together make their vision a reality. This isn't normally the type of book I enjoy but I can’t recommend it highly enough! This book is a light account of the ten years an American family spent abroad while the parents worked as teachers in developing countries. I was about to write “a typical American family”, but Jill and Dan Dobbe’s interest in other countries and willingness to embrace other cultures make them far from typical. The involvement of their very young children – aged two and one when the Dobbes left the US, for Guam – brings an unusual perspective to the genre of “travel memoir”. Not only are many of This book is a light account of the ten years an American family spent abroad while the parents worked as teachers in developing countries. I was about to write “a typical American family”, but Jill and Dan Dobbe’s interest in other countries and willingness to embrace other cultures make them far from typical. The involvement of their very young children – aged two and one when the Dobbes left the US, for Guam – brings an unusual perspective to the genre of “travel memoir”. Not only are many of the stories about the children amusing (such as Ali at age one “shaking her booty” in a dance until her diaper fell off; Ali and Ian singing songs in Mandarin on public transport in Singapore), but their parents’ need to arrange such things as daycare and nannies gives a rare insight into aspects of life abroad. I must confess, though, that I am firmly on the side of those long-haul aircraft passengers who scowled and disapproved of the author’s screaming, hyperactive children! I gave a small cheer at the end of the book, when Jill and Dan, after six years back in the US while the children attended high school, decided to resume their wandering ways and headed off to Cairo, followed by India and Central America. The author at one point writes: “I wanted Ian and Ali to grow up to become globally aware and live in a community where everyone is accepted for who they are despite their race, color, or religion.” What a world it would be if only we all thought like that! The stories are told in a casual and chatty style. The author rather overdoes the use of such sweeping descriptions as quaint, charming, beautiful, pristine and lovely, but some passages, such as comparing the sound of the fluttering of the wings of thousands of Monarch butterflies in Mexico to that of gentle rain, are very effective. I enjoyed reading a chapter of this book each evening over the course of a long, stressful week at work. It was a delight to lose myself in the Dobbe family’s adventures in foreign lands, and I look forward to the next instalment. Jill Dobbe’s book, Here We Are & There We Go – Teaching and Traveling with Kids in Tow is a delightful book that had me reminiscing about all my own travels overseas. Ms. Dobbe brings the life of an international educator up close and personal by real sharing adventures her family had in Guam, Singapore, Ghana and Mexico. It is a wonderful insight not only from the perspective of the traveling teacher, but the last chapter of the book which talks about reverse culture shock is equally import Jill Dobbe’s book, Here We Are & There We Go – Teaching and Traveling with Kids in Tow is a delightful book that had me reminiscing about all my own travels overseas. It is a wonderful insight not only from the perspective of the traveling teacher, but the last chapter of the book which talks about reverse culture shock is equally important for family members and friends to read. It is sometimes hard to understand what a former traveling couple has to adjust to when returning back to the United States. Ms. Dobbe’s book does a remarkable and realistic job of taking us into the mindset of the returnees and the challenges faced by those who come home, only to find that ‘home’ is no longer familiar. I loved the way Here We Are & There We Go portrayed life on the road with children. From the craziness on long international flights, to the crankiness of jet lag in unfamiliar settings, Dobbe leaves out none of the unpleasant moments or the pure joys of having children grow up as citizens of the world. I could feel the pride she had of having her two small children sing in Mandarin for a group of Chinese tourists. Memories like that can’t be bought. And, they are exclusive to those who venture outside their own borders. This is an important book for everyone who is considering a career in international education, but it is just as important for those who stay behind. It allows us to live vicariously, if only for a few hours, through the eyes of those who dare to hear the call of adventure and to act. It certainly teaches us to be more courageous and to find the value in stepping outside of our comfort zones. I will be recommending this book to all of my colleagues, and friends, and especially to my own children who also grew up as kids on the road. Normally I try to write reviews as objectively as possible, taking into consideration readership as a whole and not just my personal opinion. However, because Here We Are & There We Go is such a personal account of the Dobbe Family’s trials and tribulations as they move across the globe, it seemed only fitting that I make an exception. As a die-hard chick-lit romance kinda gal, memoirs, autobiographies and anything based on geography does absolutely not float my boat. Surprisingly though, I f Normally I try to write reviews as objectively as possible, taking into consideration readership as a whole and not just my personal opinion. However, because Here We Are & There We Go is such a personal account of the Dobbe Family’s trials and tribulations as they move across the globe, it seemed only fitting that I make an exception. As a die-hard chick-lit romance kinda gal, memoirs, autobiographies and anything based on geography does absolutely not float my boat. Surprisingly though, I found this particular book completely fascinating. Stories of moving to unheard of islands with small children, being confronted by armed guards and dinners containing cat had me glued to the pages, and it became almost impossible to put down. Dobbe’s excellent recall is an especially important factor as she gives real-life events an almost story-like quality with high levels of detail. I really liked the family unit and it put a smile on my face to read about such an amazing family unit, as opposed to cheating spouses, unrequited love, etc. As far as I am concerned the book was over far too quickly, but I came away with a fresh at life and feeling as though I had just travelled the world vicariously through Jill Dobbe’s eyes. Here We Are & There We Go – Teaching and Traveling with Kids in Tow by Jill Dobbe is a memoir of an American couple who taught for a decade in foreign countries while raising a family. From the blurb, I expected a humorous book; though there are a few chuckles, the book is more informative than funny. I found it fascinating to read about what foreign teachers do and how they live in various countries. I loved the descriptions of the places they visited (over thirty countries) while living ab Here We Are & There We Go – Teaching and Traveling with Kids in Tow by Jill Dobbe is a memoir of an American couple who taught for a decade in foreign countries while raising a family. From the blurb, I expected a humorous book; though there are a few chuckles, the book is more informative than funny. I found it fascinating to read about what foreign teachers do and how they live in various countries. I loved the descriptions of the places they visited (over thirty countries) while living abroad and the experiences they had in dissimilar cultures. Jill Dobbe’s recollections describe how she fulfilled her goal “to visit faraway places, eat exotic foods, learn to speak other languages, and engage with and live among people of all different cultures.” Trough Ms Dobbe’s eyes, I learned a little about living abroad as overseas international educators, exploring the world with children, and the places she lived in and traveled to in Asia, Africa, Europe, and South America. Here We Are & There We Go by Jill Dobbe is a hearty read. A travel book, it immerses the reader in the daily common life of Guam, Singapore, Ghana, and Guadalajara, Mexico. With words she painted vivid visions of the cultural customs, landscape, homes, and the people of the countries. Jill tells the pros and cons of living and traveling abroad with small children under age of four years, adapting, their life style from the land of plenty to a third world life style. Although her family strugg Here We Are & There We Go by Jill Dobbe is a hearty read. A travel book, it immerses the reader in the daily common life of Guam, Singapore, Ghana, and Guadalajara, Mexico. With words she painted vivid visions of the cultural customs, landscape, homes, and the people of the countries. Jill tells the pros and cons of living and traveling abroad with small children under age of four years, adapting, their life style from the land of plenty to a third world life style. Although her family struggled to make it during the first few months of waiting for their pay checks, in the third world countries their life style was filled with the richness of the cultures, socialization with the native people and their peers of international teachers. They were able to employ babysitters, live-in house staff, and afford vacations to regional or close by desirable travel destinations like Rome, Japan, and Paris. This book can serve as an informational resource for people wondering what life is like living and working aboard. I absolutely loved it. It was a delightfully entertaining and engaging read. Within the first few pages I found myself fully invested in this family's adventures and the well-paced narrative held my interest throughout. Much more than an international travel log, "Here We Are & There We Go: Teaching and Traveling With Kids in Tow" is a story about an American family's willingness to abandon their comfort zone, embrace the unknown and roll with the punches along the way. -- Ale I absolutely loved it. It was a delightfully entertaining and engaging read. Within the first few pages I found myself fully invested in this family's adventures and the well-paced narrative held my interest throughout. Jill is an international educator, travel writer, amateur photographer, and author of three travel memoirs, who writes about her experiences living and working in schools and countries around the world. She presently lives in her seventh country, Honduras, with her husband, and Yorkie-Poo, Mickey. While working as an elementary principal, Jill continues to read, write and take photos of the beauti Jill is an international educator, travel writer, amateur photographer, and author of three travel memoirs, who writes about her experiences living and working in schools and countries around the world. She presently lives in her seventh country, Honduras, with her husband, and Yorkie-Poo, Mickey. While working as an elementary principal, Jill continues to read, write and take photos of the beautiful people and countries of Latin America, while muddling her way through the Spanish language. Jill loves her life as an international educator and obsessive traveler, and most days, feels like she is living her dream. Jill is always thrilled to hear from educators and readers who are interested in overseas education, or already work overseas.